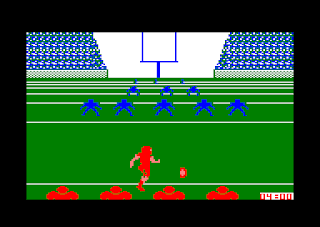 GFL Championship Football is an American Football game that was first released on the Commodore 64 in 1986. It adopts an innovative first-person perspective and allows you to compete against either the computer or a friend. There's 28 teams and you can choose to play for either 4 or 7 minute quarters. On Offense, you control either a Receiver (pass plays) or Tailback (running plays); once the ball is snapped, on-screen arrows point you towards your assigned area in order to catch the ball or rush between tacklers. The ability to audible is advanced for the time, but the most impressive feature is the large number of plays on offer that include long/short passes, sweeps, draws and traps. The gameplay is certainly more of a simulation, as (for example) post routes require you to listen for audible clues such as taking six optimum steps forward before breaking off; this is actually quite a fun mechanic and tasks you with learning complete accuracy and skill to run routes most effectively. Defense is where the game disappoints, as you can only call the plays and have no control over what happens on the field. This results in a pure coaching role, but at least there's still tons of options, such as calling blitzes, safety rolls and nickel formations. Special Teams consists of the usual kickoffs, punts and field goals, with maximum distance earned by pushing the joystick button as soon as the ball hits the kicker's foot; again, there's not much input here, but the ability to control distance through perfect timing is enjoyable. 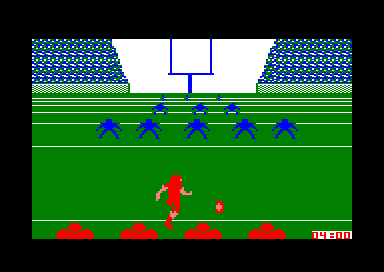 The biggest bugbear is the play calling screen, as the controls are reversed (e.g. down is up, up is down) when selecting a play from the vertically displayed list; it's easy to get confused, and the strange, lengthy delay between selecting a play and getting back into the action is tedious. GFL Championship Football is an unusual American Football game, but despite the presentation quirks and lack of Quarterback control, it works surprisingly well. The deep play choices, ease-of-use and immersive camera angle lead to a fun and unique gaming experience that's very technically advanced for its time. Random trivia: The game was also ported to the ZX Spectrum in 1987.